The State of Rhode Island has recently implemented changes which impact recycling procedures at Providence College, as the state now uses a “single-bin system.” That is, bottles and cans no longer need to be recycled separately from mixed paper. From now on, any recyclable bottle, can, or paper item may be placed in either of the two types of recycling receptacles on campus (those labeled “Bottles and Cans” or “Paper Only”), regardless of the current label. We appreciate your patience as we work to update our website and the labels on recycling receptacles, which will eventually read “Mixed Recyclables.” Thank you! The Recycling Program at Providence College endeavors to reduce waste on campus, promote the recycling of materials, and maintain and promote a clean, sustainable and environmentally conscious campus. Recycling for certain categories of solid waste is mandated by Rhode Island State law. The Providence College Recycling program maintains statistics for everything that is recycled, and submits an Annual Recycling Report to the R.I. Department of Environmental Management. 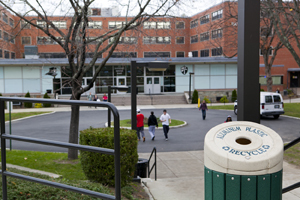 A successful program is achieved by ensuring that all buildings and outdoor areas on campus are equipped with the proper recycling receptacles. Old receptacles and containers are replaced with new ones on an as-needed basis. 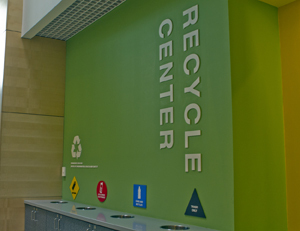 Recycling stations are currently located in the Accino elevator lobby, and across from Dunkin Donuts in Lower Slavin. Students, faculty and staff are kept up-to-date through our newsletter, The Campus Green, as well as occasional mass emails. The program also works on issues of reuse, waste reduction, energy and water conservation and awareness of various environmental issues. The program strives to make Providence College a model of a sustainable and environmentally responsible institution. 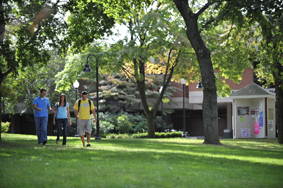 In the past few years the college has made an effort to make the campus more environmentally sustainable and because of that there have been many “green” additions to the campus. Below is a link to a map that shows these additions, such as bioswales and hydration stations. 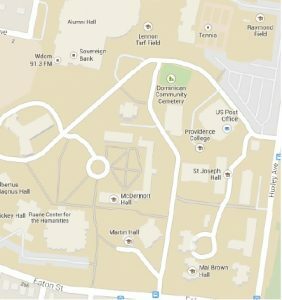 The map is also meant to be a guide to those who have trouble finding recycling bins, including the location of recycling bins in residence halls and outdoors. Once in the map you are able to choose what you look at, the map will at first show all the hydrations stations, bioswales, and recycling bin locations but you only need to look at the left side column and click off the layers that you do not wish to see.